Stitches (above left) and Amos (above right) were adopted in January 2000 by Cass and Beth, who write: "Stitches & Amos have adjusted perfectly and are a wonderful addition to our family of four cats. JJ (above center), was adopted from Kitty Angels in the spring of 1999and is now all grown up. At 5 AM every morning all three boys sit at the end of the bed. Stitches is the self appointed alarm clock and makes everyone's presence known by walking up and down the bed, nudging us and purring loudly until someone gets up to feed the gang. 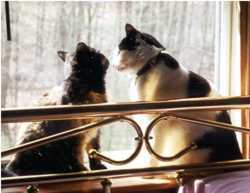 Paul and Shari adopted Keeko (on right) in April of 1999. They write, "He was approximately one year old at the time. Keeko has been an absolute joy to have around for the past year plus! He's just a big old sweetie who loves to be held, petted, and having his chin and back scratched. He also particularly loves to curl up in the bathroom sink while we're trying to brush our teeth. This past February (2000), we added Shelby (left, formerly named Maypo - approx. 7 months old at the time) to our family. At first she was incredibly shy, and basically lived under our bed. She is still learning to trust again (she was a "street kitty" in Lowell when you scooped her up as I recall), but she is becoming very affectionate! Although she still does not like to be picked up, she LOVES to be petted and scratched, and purrs like a diesel engine whenever she receives the attention she craves (and sometimes outright demands at 3AM!!) As you can see, these two rascals have become the best of friends - not too mention the light of our lives!! Thanks again for bringing these wonderful creatures into our lives!! " 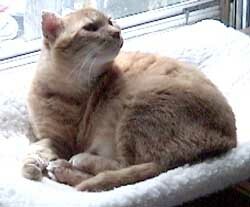 Gina adopted Captain Nemo (formerly Tripod) in May 2000. She writes, " He's doing as well as can be expected since he is a special needs cat. The apartment is set up to allow ease of climbing for the three-legged Captain Nemo. The window shelf is conveniently located near the bed for his choice of seating. His FIV condition seems to cause him to sleep a lot and he does have frequent digestive problems. But, on his good days, he loves to play and get into mischief. Good or bad day for Captain Nemo, he is always ready to give lots of love." 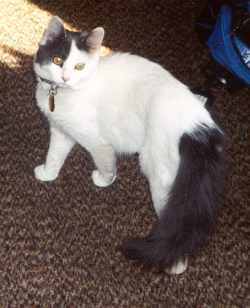 Nancy and David write, "We have had Pooka since September of 1999 and she is, by far, the craziest cat we've ever had. She's not like your normal cat...she loves to play fetch, watch TV and drink out of the toilet! Life with Pooka is NEVER boring...."